That’s not actually a thing. It just so happened that we had our first Cilantro Lime Instant Pot Rice recipe L-A-S-T Wednesday. Andddd, we have an Instant Pot recipe TODAY. Guys. 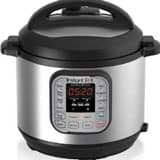 Have you got an instant pot yet? Unless you forget to, you know, put the cooking bowl inside before you put your rice and water in. I don’t know how I forgot to tell you that last weekend. I ACTUALLY DID THAT. I thought I broke the Instant Pot since there was rice and water ALLLL in the electric-makes-it-work bits. Mr. FFF even had to get a shop vac out to BLOW AWAY THE RICE. Anyway. 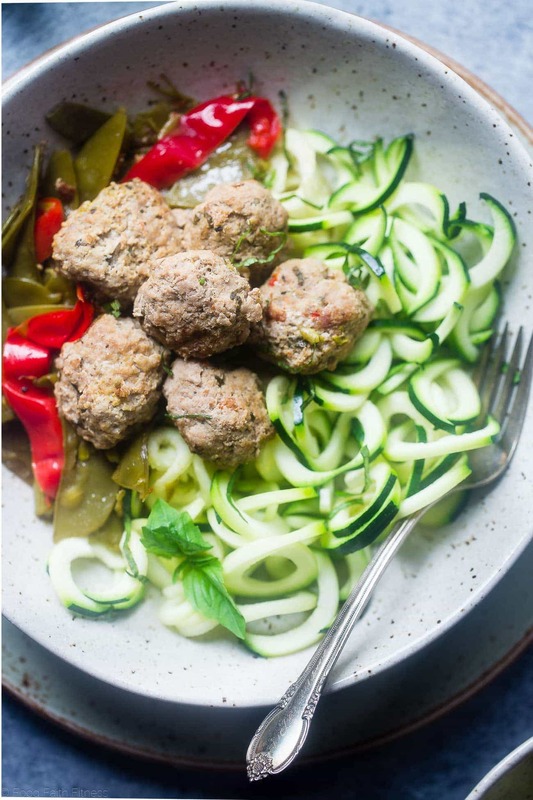 There is no rice in this easy paleo Italian meatballs recipe. Just making sure you don’t do silly things like I do. I am pretty much head over heels for the fact that you and I can sauté AND cook our meatballs and vegetables ALL IN ON VESSEL NOW. If you’re anything like me, you’re ALL ABOUT LESS dishes to clean up. 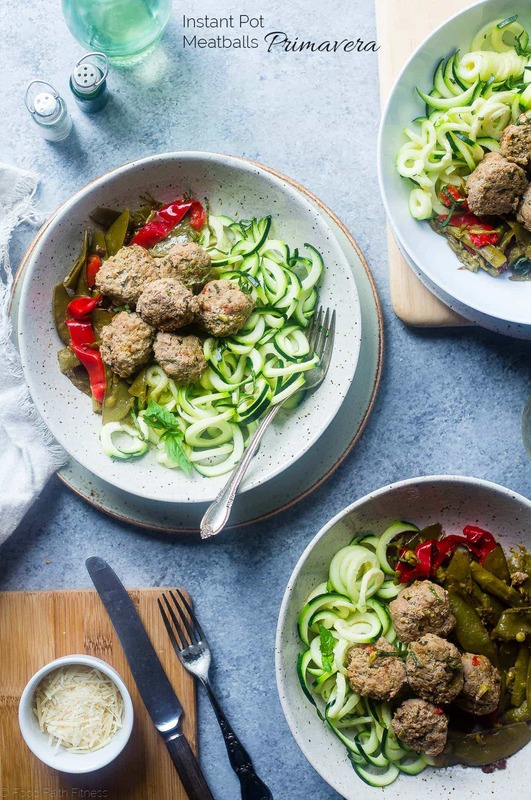 These paleo chicken meatballs (don’t use turkey – it didn’t taste as good!) have this golden brown outside that EXPLODE with JUICINESS and BURSTS of fresh basil in every. Single. Bite. Layer that on top of ultra-crisp fresh zucchini noodles and a tower of our favorite spring veggie friends – peas! Asparagus! Tomatoes! – and you can call this easy PEAS-y recipe (just laugh with me) the champion of your light-and-healthy-spring-food-loving HEART. P.s I know there are no tomatoes in the pictures. I kinda forgot to add them. DON’T DO THE SAME. DON’T BE ME. P.s, the sequel: if you’re not paleo/whole30 a sprinkling (read: DOUSING) of Parmesan cheese is HIGHLYYY recommended. Always giving you all the facts. The paleo meatballs themselves are based of the paleo sweet and sour meatballs from last year, that basically BROKE THE INTERNET. Apparently, you guys are meatballs fanatics and like really, really yummy food. 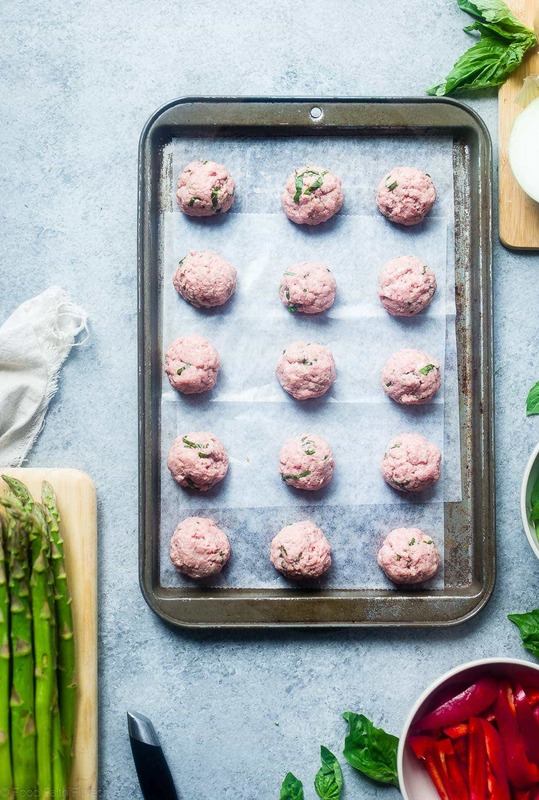 But we switched up the beef fo’ chicken and added ribbons of spring-time-fresh basil and ALL THE VEGETABLES to this paleo meatball recipe. In the Mexican Stuffed Sweet Potatoes with eggs I told you that cilantro was my spirit herb. BUT, I think that fresh basil MAY be giving it a run for its money. 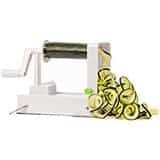 If, cilantro made money of course. However, I tried to buy one of those “living basil” plants from the grocery store. AND IT DIED AS SOON AS IT GOT HOME. Anyway. I’ll stop being basil-bitter. 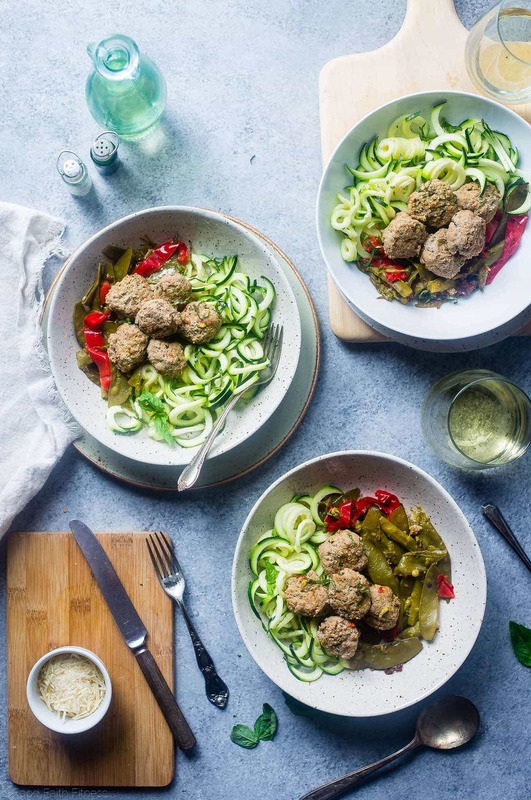 This meatball-and-veggie combination is similar to a pasta primavera. Excepppppppt, without the pasta and we added meatballs. I guess that means that just the FLAVORS are similar. Things to note: the “sauce” is just chicken broth. If you use zoodles, they will NOT absorb it, and you may need to use a spoon to eat this dinner. TOTALLY okay, that’s what I did. If, on the other taste bud, you use cauliflower rice, you won’t have this problem. Again, both are VRY good life choices. Just ALWAYS giving you the SCOOP. 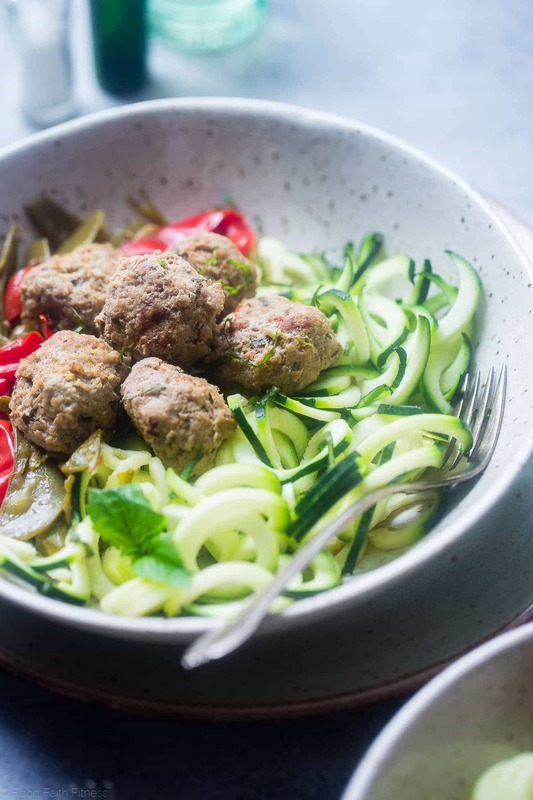 The ONLY scoop that I can’t help you with is the one that will get springy-herby-fresh easy paleo Italian meatballs into your HUNGRY mouth. I suggest you make it a BIG ONE. 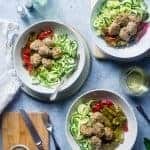 These low carb Easy Paleo Italian Meatballs In The Instant Pot are made with chicken and taste like pasta primavera! A healthy, gluten free and whole30! In a large bowl, mix together all of the meatballs ingredient (except the oil) until well combined. Form into 16 large meatball and set aside. Turn your Instant Pot onto the "sauté" setting and add in 1/2 Tbsp of the avocado oil. Once the oil is heated, add in the sliced pepper, asparagus and snow peas. Cook, stirring frequently, until the veggies just begin to color, about 3 minutes. 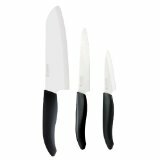 They cook a lot under pressure, so don't over-cook them here! Remove the veggies from the Instant Pot and add in 2 tsp of the remaining Avocado Oil. Add half of the meatballs in, on the outside of the pot where the oil pools, and cook until golden brown, flipping once, or about 2 minutes per side. I find that using a fork to loosen them off the pot and to flip is the easiest. Transfer to a plate and add in the remaining 1 tsp of oil. Add in the rest of the meatballs and cook the same way. Once cooked, add the rest of the meatballs back in and pour the vegetables into the pot, over top of the meatballs. Pour in the chicken broth. Cover the Instant Pot, making sure the lid is locked and the vent is set to "sealed." Turn the Instant Pot onto manual mode and cook, using high pressure, for 10 minutes. Once cooked, allow the instant pot to steam release naturally, opening the lid only when the little button drops down. Once cooked, stir in the halved cherry tomatoes. *You should only need 6 tsp of coconut flour, but I tested this a few times and sometimes needed an extra tsp. **I have the 6 quart Instant Pot, and I found it was easier to brown the meatballs in 1 large batch and one smaller batch. If you cram them in too tight, they can be hard to flip. ***The chicken broth doesn't thicken, this is normal. If you serve over zucchini noodles, you may not need to pour over all the broth - make it as "liquidy" as you like! YOU MAKE THIS RECIPE, PLEASE REMEMBER TO TAG @FOODFAITHFIT AND #FOODFAITHFITNESS ON INSTAGRAM! I LOVE SEEING YOUR RECIPE RECREATIONS! ???? STAY IN DA KNOW ABOUT BEHIND-THE-SCENES INFO GOING ON AT FFF BY KEEPING IN TOUCH ON TWITTER,FACEBOOK AND PINTEREST! Your meals are always so pretty, and I love how you got right on making all the delicious food in the Instant Pot. We absolutely love using our Instant Pot; we used it for mashed potatoes on Sunday, and it was so fast. Meatballs are some of our favorite foods here. I NEED TO TRY THAT! It all looks so fresh and good! Omg, yum! Taylor this recipe looks delish and I appreciate every time you give us the scoop! Can you send this to me for lunch? What a beautiful recipe. And beautiful photos! Giiiiiirl! I really need to get an Instant Pot! 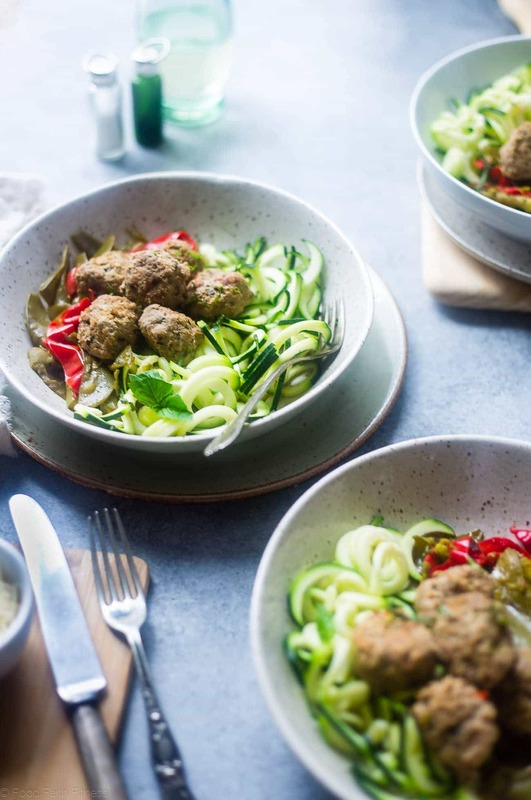 These meatballs look amazing, and I’m 200% itching to try all the Instant Pot possibilities. Bravo, sister…as always, bravo! Thank you so muchhhhhh! AND YES you DO need one. It is seriously THE BEST! GAH! I seriously can’t wait to try these. I need to be better about using my Insta Pot and these look on point! What a mess! Glad hubby was not here to see it. Is it possible to make this in the slow cooker? It looks delicious!! I am sure you can, if you sautee them in a pan first. But, as I have not tried it, I could not give you directions – sorry! let me know if you try it! I made this tonight, and I seasoned as I went along. The meatballs still were very bland. I was very disappointed. I followed the recipe to a T otherwise, and found that after 10 minutes, the Instant Pot was bone dry (burnt) and there was absolutely no broth left. I don’t know if there was a mistake in the recipe, but I can say I have been an accomplished at home cook for over 20 years, and this has never happened to me before. I am just grateful I wasn’t making for guests. I think that the amount of broth needs to be increased, and there needs to be the addition of salt and seasonings. That is very strange, as that didn’t happen to me at all – my meatballs were very “brothy.” I am sorry you didn’t enjoy them! I really wanted to like this recipe as I am new to the Instant Pot. I followed the recipe exactly. Vegetables were very bland and overcooked. The meatballs weren’t bad but also lacked flavor and consistency. Sorry for the negative comment but this recipe needs some serious adjustments. Maybe fresh garlic in the meatballs? Just saute the veggies and don’t kill them? I think that would be a start. I’m sorry you didn’t like this recipe Nic!